The Netherlands is a remarkable country, famed for its picturesque flat landscape, resplendent tulip fields, windmills and canals. The many pretty towns and villages lie unchanged through the centuries and the long coastline of pristine sandy beaches is backed by dunes that protect this low-lying country from the ravages of the North Sea. Hiring a car is the ideal way to get around, whether you’re here on holiday or on a business trip. Our branches are conveniently located at a number of major cities, including Amsterdam, Eindhoven, Rotterdam, The Hague and Utrecht, as well as at all major airports and key destinations. We’ll make sure to get you in the right car for your trip and out on the road as quickly as possible. When booking with us, you’ll also benefit from no credit card fees and no hidden extras. For such a small country, the Netherlands packs a big punch. Add the friendly, laid-back vibe of the Dutch people to the mix and you’ll quickly see that a visit here is a tantalising proposition. 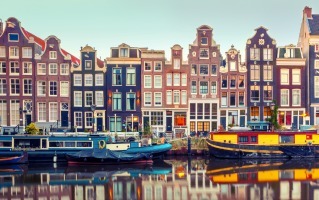 The entry point for most visitors will be the country’s charming, historic capital of Amsterdam – famous for its intricately woven network of canals. These wondrous waterways are regularly punctuated by quaint humpback bridges and overlooked by streets of handsome 17th-century houses with their distinctive gabled facades. Amsterdam is a major attraction for art lovers and its Rijksmuseum is the country’s foremost art museum, packing in a fabulous collection of Dutch paintings. Pride of place goes to the collection of Rembrandt pieces, but the many other highlights include the paintings of Johannes Vermeer as well as some wonderful canvases by Frans Hals. A visit to the neighbouring Van Gogh Museum is equally satisfying and boasts the most complete collection of Vincent Van Gogh’s work anywhere in the world. Zuid-Holland (South Holland) may be the most populated part of the country, but there are many good reasons to head south. A short distance from Amsterdam is Leiden, a beautiful university town with an ancient centre patterned by canals and full of fine old buildings. Less than half an hour further south is The Hague (Den Haag), an attractive city with a number of good museums including the world-renowned Mauritshuis. It features the best of Dutch Golden Age painting and includes such masters as Holbein, Rubens, Brueghel, Rembrandt and Verneer’s famous Girl with a Pearl Earring. Neighbouring Delft is famous as the home of the distinctive blue-and-white Delftware, and its lively market square is lined with handsome seventeenth-century buildings. Leiden and The Hague are only a short drive from the sprawling sandy beaches of the North Sea coast as well as the stunningly bright colours of Amsterdam’s legendary tulip fields, best experienced in all their rainbow glory in spring at the nearby Keukenhof gardens. 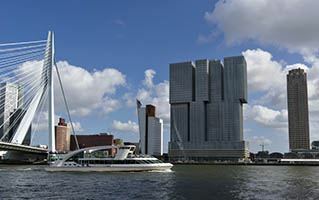 The Netherland’s second largest city, Rotterdam, is home to the largest port in the world. It’s a vibrant city with many top cultural attractions, most notably the Kunsthal gallery of contemporary art and the Museum Boijmans van Beuningen, which has an outstanding art collection including works from all the great Dutch painters. About 20km north-east of Rotterdam sits Gouda, a picture-perfect Dutch country town, famed for its eponymous cheese and home to the Netherlands’ largest market square. North of Amsterdam is the province of Noord-Holland, a landscape of baize-green fields, punctuated by windmills. The main highlight here is Haarlem, a laid-back town with more than its fair share of Golden Age buildings and a fantastic art gallery. A short distance to the north is the town of Alkmaar, famed for its summer cheese market and a good base for exploring the North Holland Dune Reserve and the Schoorlse Duinen Nationaalpark. In the far north you’ll find the wild and beautiful island of Texel, a great place to enjoy some serenity and solitude. Car rental in The Netherlands gives you the freedom and convenience to make the most of your trip to this country of contrasts and beauty – from exploring Amsterdam to discovering the breathtaking tulip fields of Haarlem and Leiden. One of the great appeals of renting a car in the Netherlands is the fact that the country is so compact, meaning everything you’ll want to see is within easy driving distance. One of the highlights is the stunningly beautiful Flower Route (Bloemen Route) which runs south from Haarlem to Leiden. This is best done in late April and May when fields of tulips, hyacinths, narcissi and daffodils of every possible hue stretch to the horizon. The A4 is the main access route for the south-west of the country, running from Amsterdam to Rotterdam in just over an hour. Along the way it passes Lieden, The Hague and Delft. Haarlem is west from Amsterdam along the A5, and from there the A9 takes you north to Alkmaar, beyond which the N9 heads to Den Helder, the jumping off point for the stunning Texel island. The A2 heads south-east from Amsterdam to the city of Eindhoven, an hour-and-a-half away, and the neighbouring city of Tilburg. From Rotterdam the A16 heads south to Belgium, via Breda, from where the A58 runs to Tilburg. When driving in towns and city centres, you’ll need to adapt to the sheer volume of cyclists. You should also learn the rules of the road and the parking options before setting off. It’s also worth noting that trams have the right of way at most intersections, and, as in many European countries, traffic coming from the right at a junction has right of way by default unless otherwise indicated. Outside of town centres, driving is generally straightforward. The roads and highways are very clearly signposted. As with most of Europe, driving is on the right and speed limits are 50km/h in urban areas and 80km/h outside, unless marked otherwise. On motorways the speed limit varies between 100 and 130km/h and will be marked.